Purpose: All skill level evaluations will be kept confidential. Players' ratings will be shared with director, coordinators and coaches only for the purposes of drafting teams of equivalent skill levels. Goal: All teams selected by 3/25 with practices beginning first week of April. The drills and player evaluations will be conducted by the NYAA directors, coordinators and coaches. All efforts will be made to hold both indoor and outdoor tryouts, however due to availability and weather, locations may have to be adjusted. The tryouts will be required for all players aged 9-15 that want to play on the more competitive teams. They will be broken up into groups by level, Biddy, Midget and Knee High. 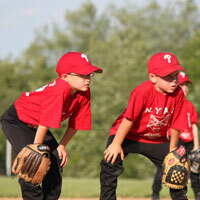 All players will be evaluated on various baseball skills, i.e. hitting, throwing, fielding, running, etc., and will receive a rating in each category. After the combine the Baseball Director and the coordinators will tabulate the players' evaluations. Team Drafts will be scheduled within one week after the combine. The draft will consist of the Baseball Director, Coordinators and head coaches, who will be determined after the combine. The drafts will be done by division, Biddy, Midget & Knee-Hi. The Lehigh Valley league teams will typically select the players who demonstrated the highest skill levels at the combine. The Parkland Youth League (PYL) teams will be selected from the remaining players. If possible, we will select one team for the PYL American League (higher competition) and the remaining players will participate in the PYL National League. Note: Tryouts are an open competition to field the most competitive team(s) in the highest level(s) that each age group will participate. Unless notified prior to the selection of the team(s), players participating in the tryout process understand that they may be selected to a competitive team team. If players are selected and offered a position on a competitive team- their options will be to either accept the offer or decline the offer. If the player declines the offer to play on a competative team, the player is willfully declining the opportunity to play on any of the competive teams and the players request will be fulfilled and they will be placed in the non-competitive league for the season. Minimum playing time rules shall be in place for all NYAA baseball teams for the 2019, with the exception of the Junior Legion, Connie Mack and Senior Legion teams. Starting lineups, fielding positions, batting order, and ultimate playing time decisions are to be made at the sole discretion of the head coach. For all Parkland Youth League teams, the baseball program will defer to the leagues' By-Laws and incorporate them as NYAA Baseball minimum playing time rules. In a game that is rain-shortened or called due to darkness, the coaches will not be required to meet these minimum playing time requirements. In a game that is shortened due to mercy rules that exist in the various leagues, a coach shall make every effort to meet the minimum play time requirements. If you feel that a player did not receive the appropriate playing time, please wait the required 24 hour cooling off period and then contact the head coach. In the event a coach does not comply, parents or assistant coaches shall notify the applicable Coordinator or Baseball Director within 24 hours of the infraction. The Baseball Director shall be responsible for meeting with the coach in question to determine the reason for the infraction. If the coach has willfully broken the playing time rule, he will receive a one game suspension. In the event a coach commits two rule infractions he will be relieved of his duties as a coach.